School Counselor Blog: Get Funded! School Counselors (and other education professionals!) spend a lot of our own money to buy materials for groups, projects, programs, and even basic supplies we need to do our job. The majority of the materials I buy are out of my own pocket. There are organizations, however, that assist educators in getting projects and programs funded. I have written letters to various organizations in my community for donations. I have not gotten every donation request funded, but I have received donations for the majority of my requests. Local grocery stores, Target, JC Penny's, Men's Warehouse, Staples, and Walmart have all given me donations after sending a request. Most businesses give a gift card donation and allow the requester to pick out the items. Target, JC Penny's, and Men's Warehouse were instrumental in our districts "Work the Runway" career fashion show. Target allowed us to use over $700 worth of Mossimo and Merona brand clothing for the students to model in the fashion show. JC Penny also allowed us to use $200 of their clothing. Men's Warehouse donated three suit rentals for students. I was also able to get a local modeling agency to volunteer their time for our runway show. Here is an example of a letter I wrote to a local grocery store to request donations for a School Wide Positive Behavior Intervention and Support reward. Donors Choose is an organization that funds projects and programs for educators. Members can create a project based on the items they need for their school. Once a project is up, it becomes searchable and anyone can donate to it. Projects can be shared on facebook, twitter, linked in or through email. Once a project is funded, the creator of the project must send a "thank you" to the donors. I know many people who have gotten their projects fully funded. A woman I worked with previously has gotten 5 of her projects fully funded through Donors Choose. View her active projects and completed projects. Follow Donors Choose on twitter and facebook to get updates! Donors Choose often runs special promotions with partner organziations. Adopt-A-Classroom is an organization that helps educators through support and donations. Educators register on the website and donors can search for classrooms they would like to sponsor. Adopt-A-Classroom does not require educators to register for a specific item or project. Once a donation is received, the educator's account is credited. The educator can then use the money at specific websites designated by Adopt-A-Classroom. Adopt-A-Classroom often runs special promotions. 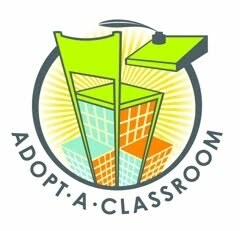 Follow Adopt-A-Classroom on twitter, facebook, and read Adopt-A-Classroom's blog for updates! I wrote a blog entry about Adopt-A-Classroom's Bag it Forward partnership with Elmer's Glue. Adopt-A-Classroom also has videos on YouTube. I saw I Love Schools featured in the current issue of Whole Living magazine. I was excited to check it out and see what it was all about. I Love Schools is an organization that allows educators, schools, and districts to create wish lists for products, resources, or services they need. Donors give money to through the website and it is credited to the educator, school, or district's account. The entity recieving the donation can then choose products from a catalog of educational supplies. I Love Schools also has a Donor Offer Board where individuals or groups can post items they are willing to donate. In my search I saw computer monitors, art supplies, and binders. Each product specifies if the donor is willing to pay the shipping or if the recipient must pay the shipping. Follow I Love Schools on twitter and read I Love Schools blog for updates! Get Started and Get Funded! I encourage readers write to local businesses and organizations and sign up for a donation site. Share your site with others on facebook, twitter, and through email. The more you spread awareness about your project the better chance you have of getting it funded! Are you a member of any of the donations sites I mentioned? Do you know of any other donation sites? Have you had any of your projects funded by local businesses or a donation site? Share you experience in the comment section or on the School Counselor Blog Facebook page! Hi. I love your ideas! Any chance you could provide a sample letter that you sent to a local business?